I'm pretty excited that my 1972 front bench seat is being redone in the next few days after the others are complete. I decided to put a front bench with center arm rest into my Vista Cruiser, but am using the cloth option that was offered (only in gold). I don't know if that option was ever available with a center arm rest, but if it wasn't, I was wondering if it would have been covered in vinyl or the same plain fabric that runs along the lower portion of the seat back. I have attached two pictures from Oldsmobile brochures, but it's not clear whether all surfaces on the arm rest were the same material and which material that was. One shows the arm rest up and the other with it down. I have two ways of looking at it that make some sense to me. My upholsterer says that compared to the plain blue fabric, vinyl would wear better and not get dirty as easy from having a sweaty arm rest on it all the time. 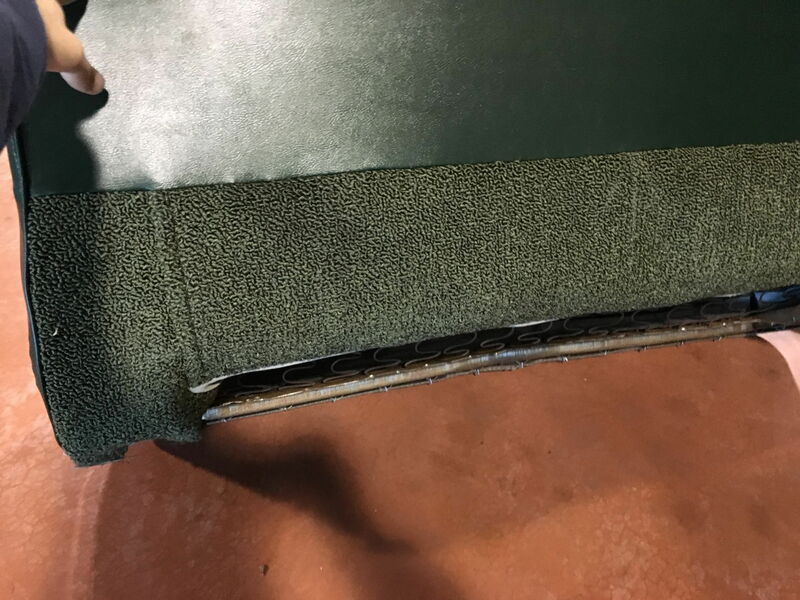 To me, it looks from both pictures like the material, at least on the horizontal (upper and lower) surface is the same fabric as on the lower part of the seat back. It also would make sense to me that that strip of cloth (fabric) running from one end of the lower seat back to the other end without being interrupted by one short of vinyl instead of one continuous piece of fabric. Finally, my upholsterer tells me that I really can't use the carpet that is normally found at the bottom of the back of the front bench seat back, as shown in my third picture because the folding bench seats lower seat frame is built a little differently than on a solid bench seat where the seat back comes all the way to the floor instead of only to the inside of the lower bench seat frame and that the carpet would be difficult to get round the edges of the lower frame and wouldn't hold up to the opening and closing of the seat back (which wouldn't really happen very often since it's going into a 4 door car (I'm mostly interested in the center arm rest feature instead of the folding seats. 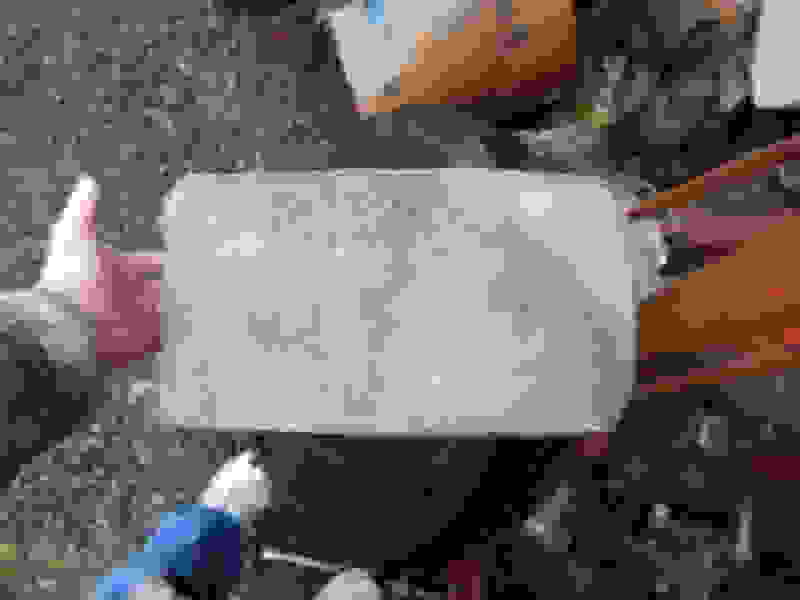 Last edited by tcolt; April 19th, 2019 at 09:09 AM. Boy, those seats look nice Tom. My 71 Supreme convertible had all vinyl on the seat and arm rest, which wouldn't look right with your completed seats. The Vista I had I put a seat out of a 72 Cutlass Supreme in it. 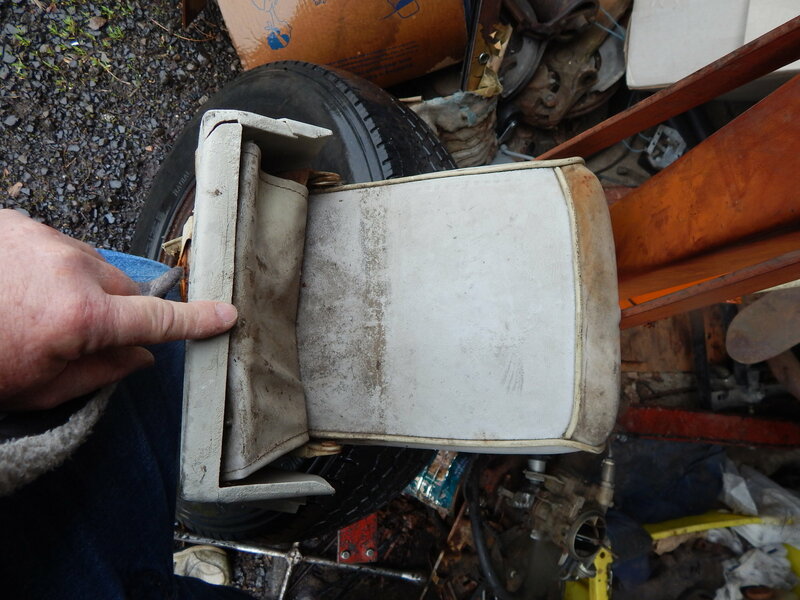 It had been reupholstered before I got it with a cloth type material but not like the original type your seats have.The seat had what appeared to be original vinyl arm rest but it had a hole in it. ( the whole seat only cost $10. at a swap meet) Anyway the wife made a vinyl cover for it. It was good enough for that car. I'll try to find a pic of it. Looks like you are making good progress on your Vista! Greg. Sorry can't find pics. My 70 Cutlass Supreme convertible bench seat has cloth material on the bottom and back side. Everything else is vinyl. Its a good thing that its cloth because when the top is down on a hot sunny day, I dont have to burn my *** sitting on a hot vinyl seat. To be correct, that armrest is, like in the pic, all vinyl. Just to be sure. In your experience the center arm rests were always all vinyl on all sides, even if that nice fabric strip along the bottom doesn't look quite as nice because it is interrupted? I wonder why Oldsmobile did that when the rest of the seat is covered in cloth? Can you tell from the pictures that we are looking at vinyl and not cloth? To my eyes it looks almost the opposite.. I'm not clear on your seat Ely. Did you mean the "bottom and back side" of your seat are cloth or of the arm rest? You obviously are not sitting on the vinyl center arm rest. What about leaning your back against it or putting your arm on it on a hot day? I'm just trying to make sure I understand correctly and I want to do it as Oldsmobile would have done it even if it doesn't make sense. Thanks. I appreciate your looking at it in a different way, but I'm trying to follow what you are seeing. I see vinyl on the sides of the bench seat. Then, a wide length of plain fabric along the entire lower portion of the seat back. Then, (probably) vinyl on the other end of the right hand seat. Then the center arm rest either in vinyl or plain fabric again. To my eye, I can't see any difference at all, especially in the blue color, between the appearance of the lower plain fabric band and the tops and bottoms of the arm rest. The sides in the gold color DO look like they could be the same as the sides of the bench seats. My 72 Supreme Convertible has all vinyl seats and arm rest. There are some conflicting opinions here. Here's my answer - both. 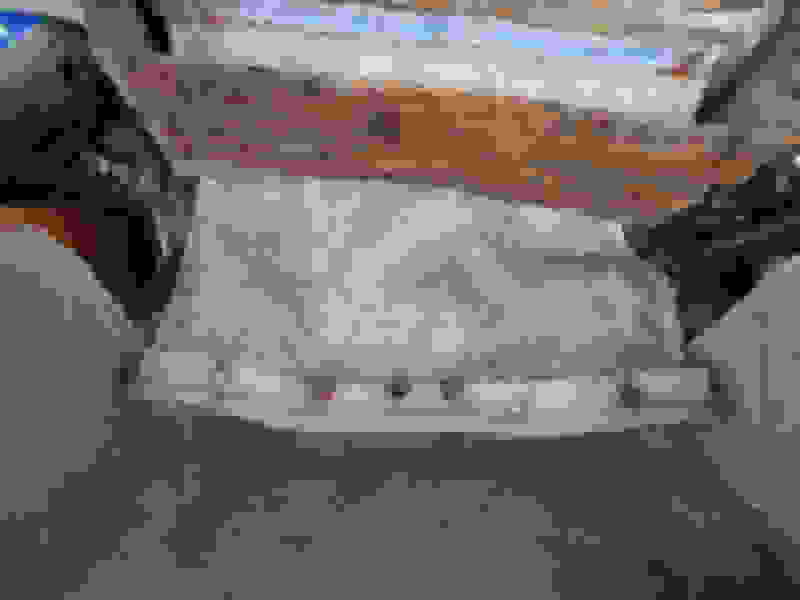 With the armrest folded up, the face would be cloth to match the plain cloth of the seat backs. This cloth will face down when the armrest is folded. The backs of the front seat should be covered in vinyl. When sitting in the back seat, with the armrest folded up, the rearward facing portion should be vinyl to match the seat backs. With the armrest folded, this vinyl will face up and you will rest your arm on it, and it will match the vinyl on the armrests on the doors. The "beauty panel" attached to the seat frame and the armrest sides will also be vinyl, like the sides of the seat backs. If you look at the pictures you posted, the top-when-up/front-when-down area has seam where the cloth and vinyl meet. I had a '67 98 with a brocade and vinyl interior. The face of the armrest was brocade, matching the seat back inserts. When folded, the part you rest your arm on was vinyl to match the seat bolsters. Your car should be the same. Are you saying you're installing a coupe seat in the your wagon? Coupes would have had carpeting on the frame. I'm thinking sedans and wagons may not have had any carpet at all on the front seat. It may have been vinyl from top to frame. 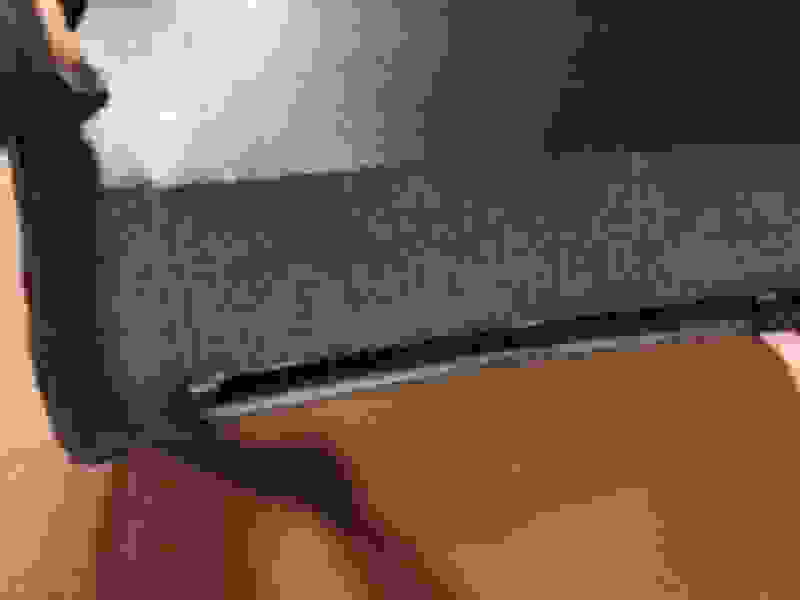 Last edited by Oldsfan; April 18th, 2019 at 05:59 PM. How would a 98 trim matter in a Cutlass? Thanks Oldsfan. I think we both are in agreement about the idea of the mixed cloth and vinyl design and I might be tempted to go that way even if this was not how Oldsmobile did it, especially since they wouldn't have installed a two door, folding front seat in a 4 door wagon, as I am doing. Also, what part is the "beauty panel" that you referred too and yes. The factory set-up for the wagon front bench seat had carpet along the bottom rear seat back to mimic the carpet on the door panels (I believe..?). I posted a picture of this above. This is a feature I would also like to keep on my "converted-use" folding bench seat even though my upholsterer thinks the carpet makes it more prone to tearing where the carpet is because of the movement of the seat back. He also says that carpet wasn't used on the folding front bench seats. I disagree, because I've seen a picture of a folding bench seat where only the visible, rear portion of the seat bottom had carpeting on it and my seats would rarely be folded anyway. Mostly, I think it is just extra work for him. Last edited by tcolt; April 19th, 2019 at 01:47 PM. 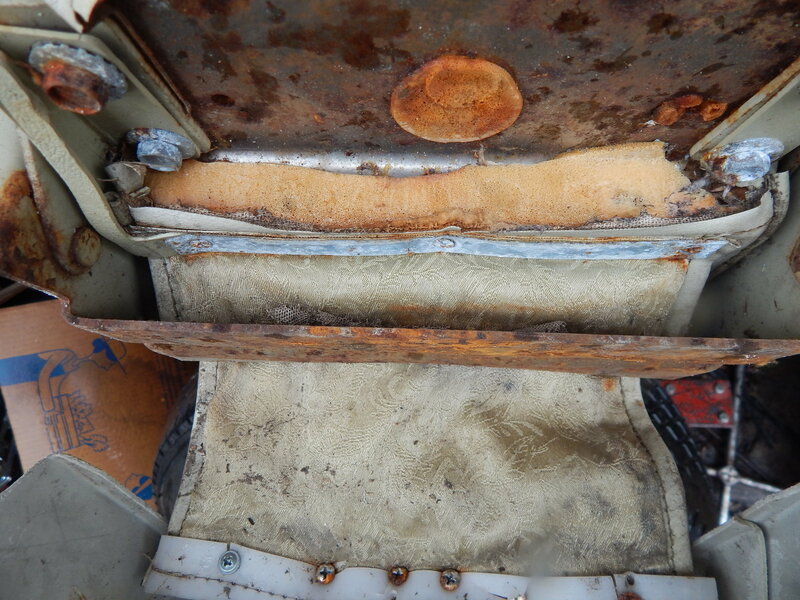 Here's a photo of a '72 Supreme sedan front seat. Only shows the armrest folded down. Clearly the top part in vinyl. You can see the seam at the front edge where the vinyl meets the cloth. 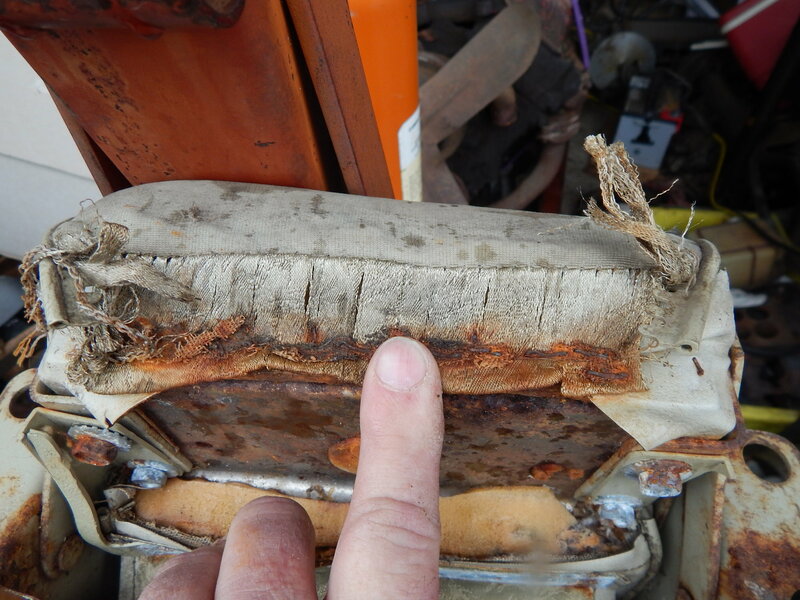 Show the following image to your upholstery guy. I was looking for a picture like this. It does show carpet on the bottom. Also shows the plain cloth going up over the back of the seat. I didn't know it did that. The problem with the carpet may be that there isn't enough of your existing carpet to wrap over the top of the frame and meet the seat cushion material. You can also see the beauty panel I referred to. I don't know the technical term for it. It attaches to the divider between the seat and the base of the armrest. It covers the gap when the armrest is folded down. Here is a '72 Supreme sedan with the armrest raised. The face of the armrest looks more like it matches the plain cloth on the seat backs than it does the vinyl on the inner sides of the seat backs. Well, I have until 1/14/2020 to buy a new computer. I did the disk repair last week, and have had no problems since. Tonight I notice the Microsoft logo down by the Firefox, Google, and Chrome tabs on the bottom of the screen where I log on/off. I wonder why that's there, as I haven't gone to Microsoft for anything. Well, it's a notification telling me that Windows 7 will no longer be supported after 1/14/2020 and that I need to back up my files and buy a new P.C. with Windows 10 installed, along with a tutorial featuring several ways to back up my files in order to move them to the new P.C. that I will be apparently buying after all. 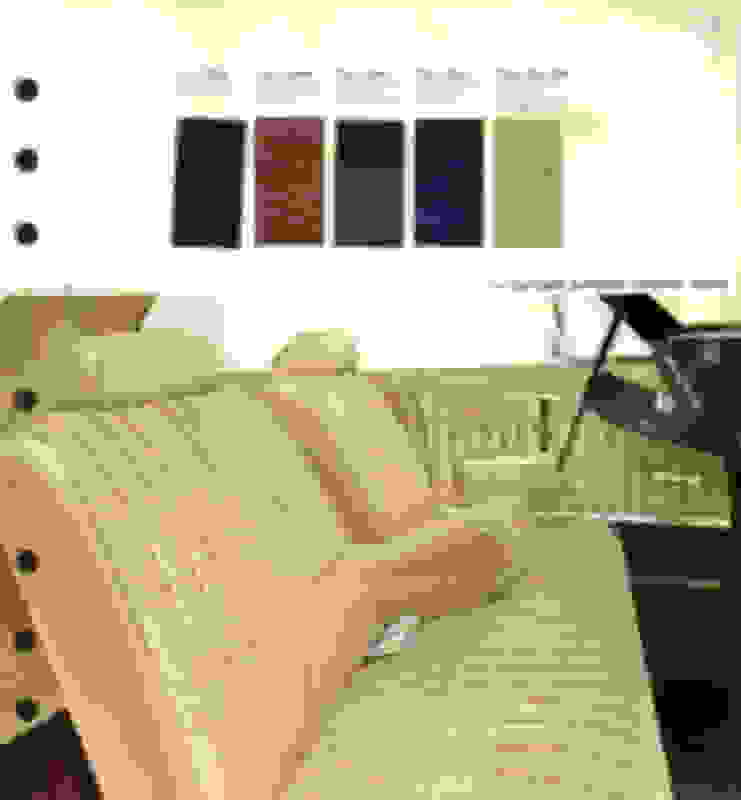 What does all that have to do with armrest fabric? Thanks for those cool pictures Oldsfan. I especially love the blue ones, which are exactly the same pattern as mine. Where are they from and how do you know for sure what year they are? 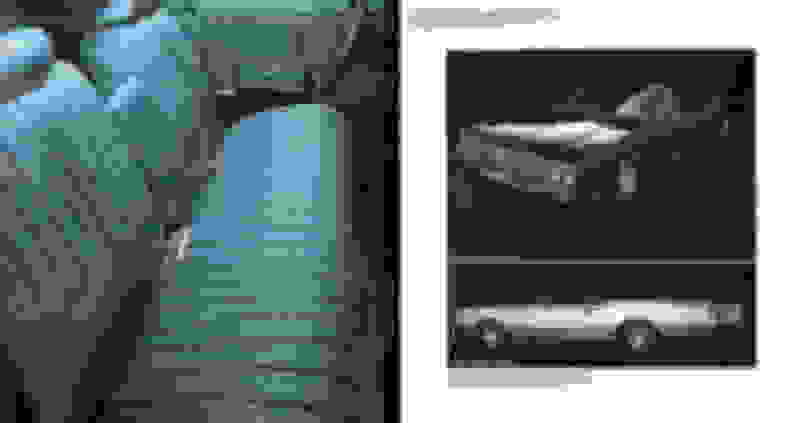 I had been searching for proof that this pattern came not only in the full size models, but also the Cutlass Supreme which makes it legit for my VC in my eyes too (analogous to the gold color which was available in the VC :-) If the pictures are from an Olds brochure what did they call the fabrics? As far as the seem between the cloth and the vinyl at the front edge of the arm rest, it looks pretty thick. It seems like there could be piping there? I don't know what to say about the two-tone padding at the top and back of the blue seat backs. Could it be a special Supreme upgrade? I have no idea on how that post got into this thread! It was posted in a completely different thread. I'll delete it..
Last edited by 1969w3155; April 19th, 2019 at 10:57 PM. Those pics Oldsfan posted are so cool. Those interiors look so inviting! Love the 4 door hardtops. But that brings up another question. (Not related to you question, Tom- I don't want to hijack your thread but I am curious). 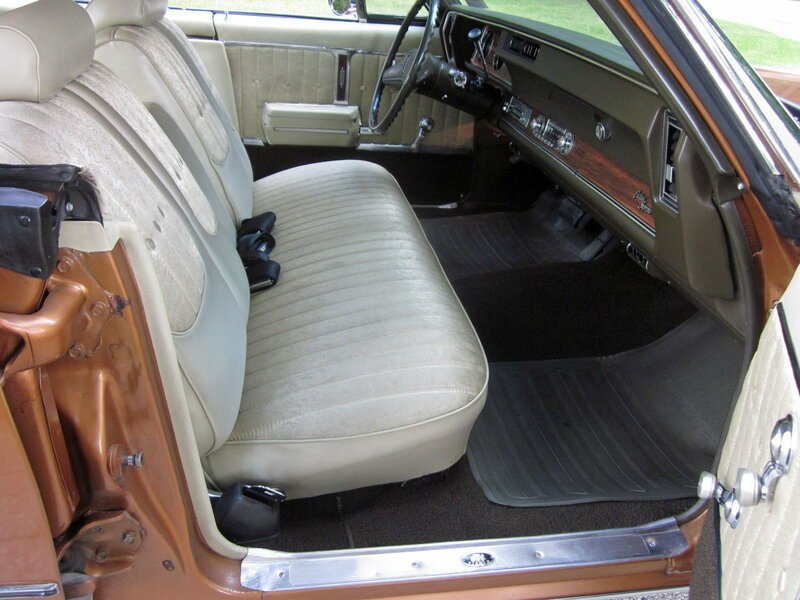 What did Olds do when using the seat with the center arm rest in a 4 door? I know when it was used in the 2 door either side can unlatch and swing forward to allow access to the rear seat. But in a 4 door? They probably used the same seat but made the seat back stationary?? If you look at the pics of the 4 door seats they have the stainless steel covers on the sides covering the hinge arms. When I put the 2 door seat in my Vista I just left the seat backs swingable, which I assume that's what you plan to do, Tom? Greg, my 67 442 came missing the driver's side seat back. I used, for now, a 70 split bench with armrest donor that I personally removed from a 4 door Cutlass Supreme 70. It was the same seat as the 2 door version and the back tilt worked as I folded it to get it out the front door. The wagons, on the other hand, had a solid seat back, to my knowledge, and of a lower trim level. As a automotive engineer, another thing we should consider is whether or not one could install a non folding bench in a 4 door in one piece on an assembly line. I have a feeling they took the Vista seat in through the back. Tcolt, here's the issue and what with which I disagreed with Oldsfan above. We need to discuss trim levels. Olds trim went F85, Cutlass S (and there may be things for post cars and wagons here), Cutlass Supreme, the various 88s, then the 98, and I think the Toronado was top dog. Seat and door panel patterns are a very cheap way to make a big visual difference in the interior with very little cost impact and no functional impact. Your wagon did not come with a center armrest, and you want to put one in, and that's fine. If you redo all the seats, you can do whatever you want. If you want to adapt a trim pattern to your existing, I would shoot for a Cutlass S level trim, as I believe that is similar to the Vista trim. The Cutlass Supreme was a notch above, and we should note that Cutlass Supreme meant different things over the years. I am not a 98 expert, so I do not take issue with some statements that the 98 had a cloth front to the armrest. The various Cutlasses did not. 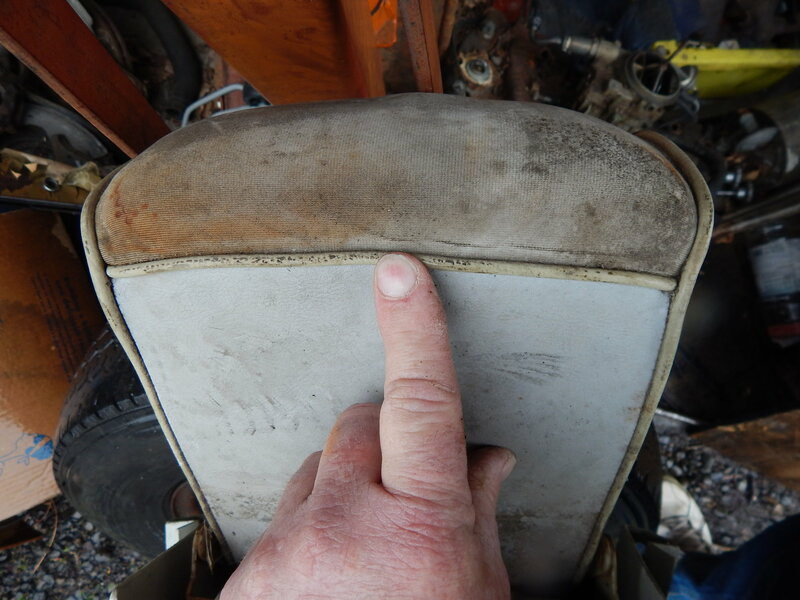 In the pictures linked above by Oldsfan, one can see that, even in the Cutlass Supreme, the armrest was all vinyl. I recommend you go all vinyl for multiple reasons. 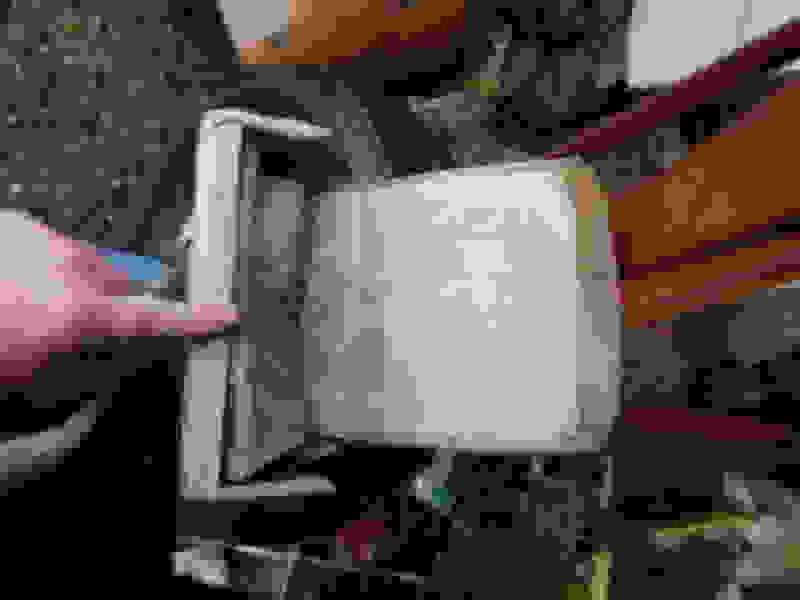 First, you will be touching this part with your elbow and your hand a lot, and it is easier to clean. Second, you will have to do pleats on the cloth to get it to be taut, and it will look odd unless done perfectly. Third, doing vinyl right is cheaper and easier than cloth. Fourth, it is the way Olds did it, if you want to look like a stock option. However, it's an armrest. You can source another one and have them done both ways, if you like, then swap as needed, so I recommend that if unsure. I may even have a 72 armrest loose from that seat I mentioned to Greg. It is hard to tell how the seam is where the cloth meets the vinyl. I've contacted a guy who is a member of the Olds clubs. He's got a '72 Supreme sedan. I've asked him a few questions about his armrest and asked if he could provide a few good pictures of it. I looked online for a '72 Vista with the covert gold cloth interior and couldn't find any. I would imagine they didn't sell many with that trim. I would imagine it would show the dirt pretty quick, and that's probably not what people wanted in a station wagon. The Vistas I did see with the vinyl interior showed the same detail on the top of the seat back panel, but, naturally in vinyl. I guess it's going to be your call whether to use cloth or vinyl. No one will ever know what is correct. 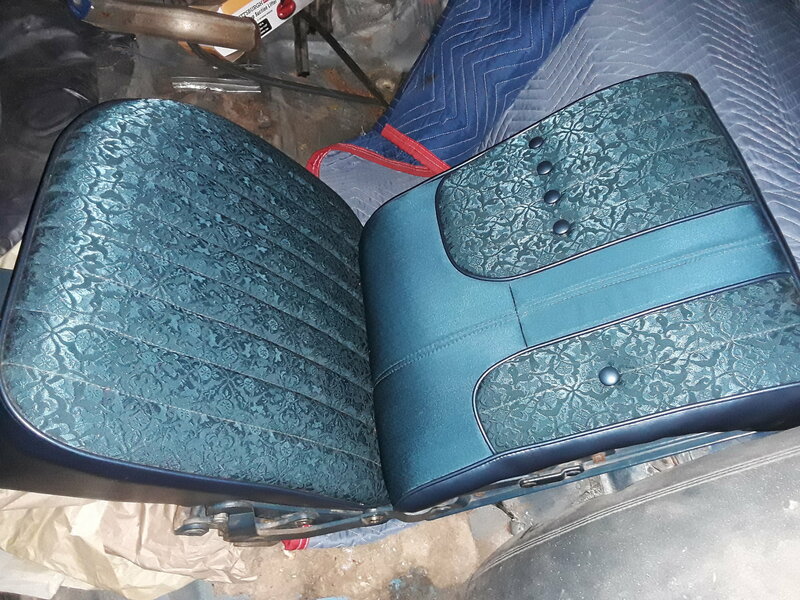 If your going to do the armrest like a Supreme sedan, then I would do the seat back upper panel the same as a Supreme sedan as well - plain cloth. Koda - if you would care to peruse the '72 sales brochure, you will see that the Vista Cruiser does in fact share an interior with the Cutlass Supreme hardtop sedan. It is not identical because the sedan had to give up a few buttons and a few pleats to make room for the folding armrest. 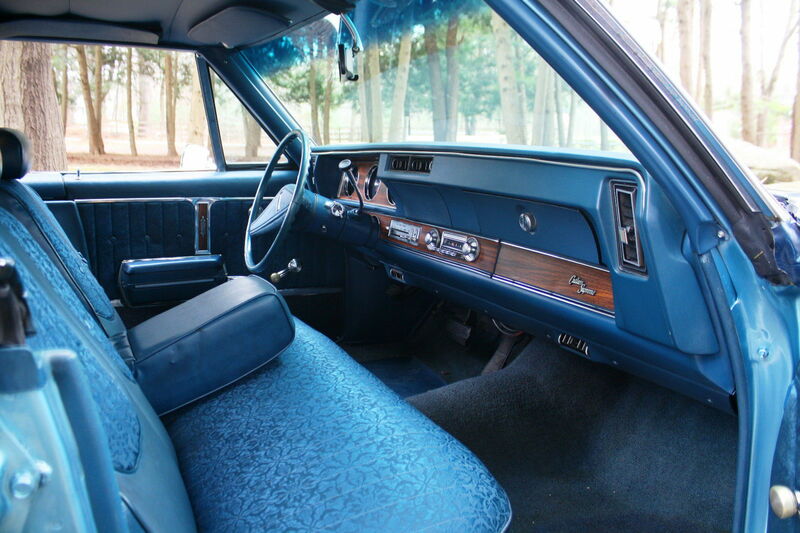 In the photo of the blue interior, the armrest appears all-vinyl because we can only see the top and sides - which are vinyl. We can't see the face. 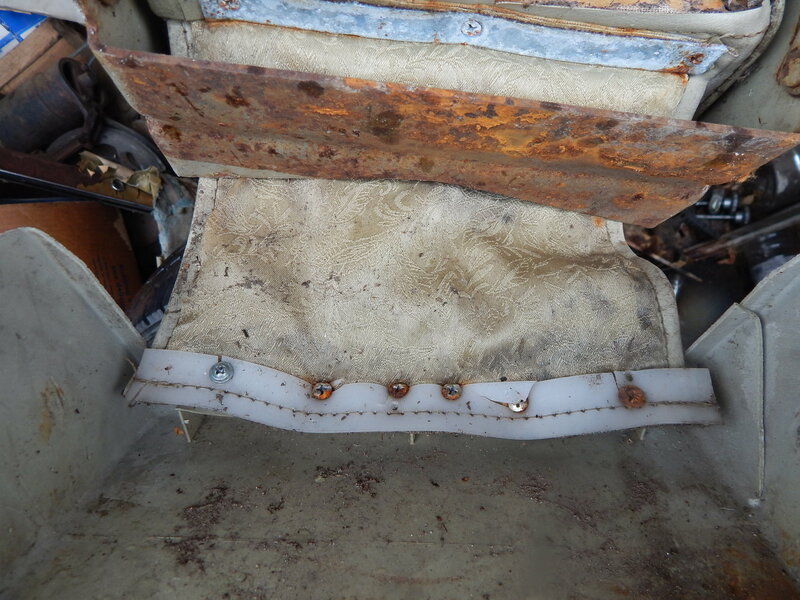 That is why I included the [not very good] photo of the covert interior with the armrest up. Look at it closely. 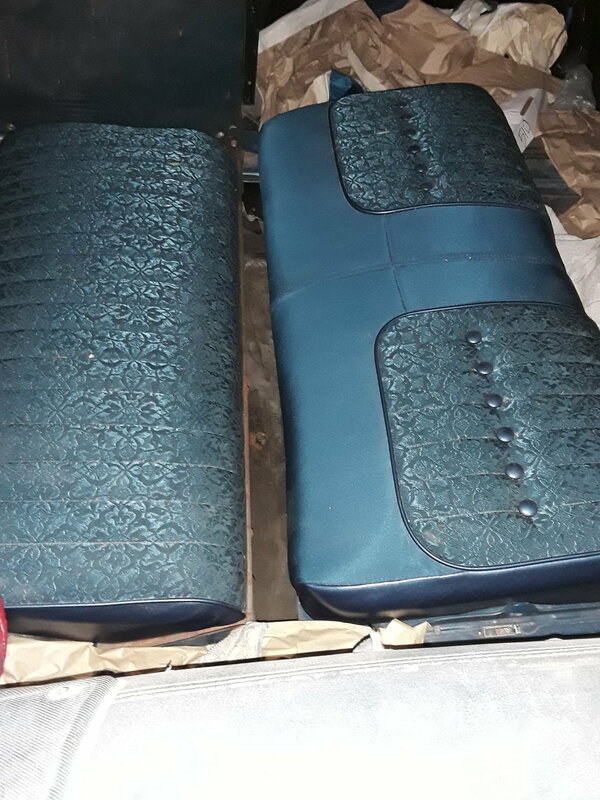 The material on the face of the armrest matched the plain cloth on the seat faces, not the lighter vinyl on the inside sides of the seat backs. And there are no pleats - it is smooth to match the plain cloth. Do not confuse the armrest on a Supreme sedan with the one in a Supreme coupe or convertible. Convertible were all-vinyl to begin with. 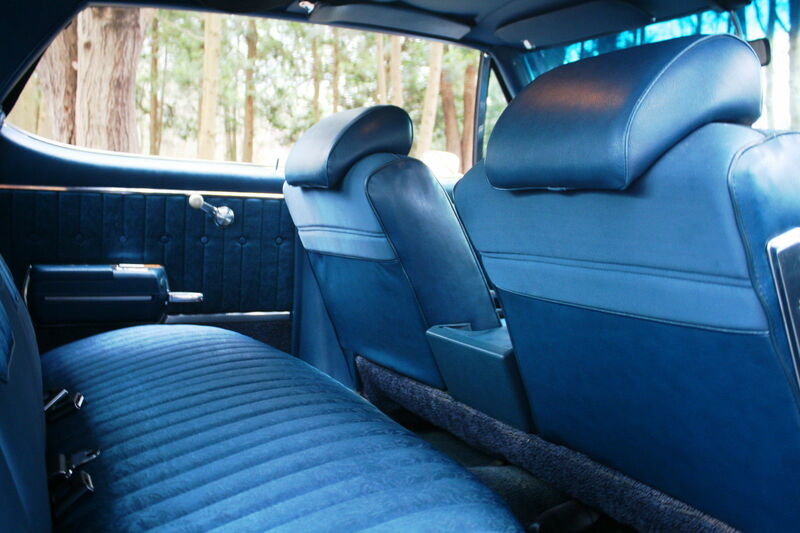 Coupes had a different upholster pattern with a broad vinyl strip in the middle of the seat cushion, which was mimicked by an all-vinyl armrest. Supreme sedans are a different animal. Well Tom I think you have your answer already. But I do have some experiences different than has been discussed here. I know these cars have been around for decades so its always possible things were changed before I got them. About 15 years ago I dismantled a 1968 Cutlass 4 door hardtop. It has the arm rest bench seat, it has the side stainless pieces just like the seat backs that tilt forward, but the seat backs are fixed. 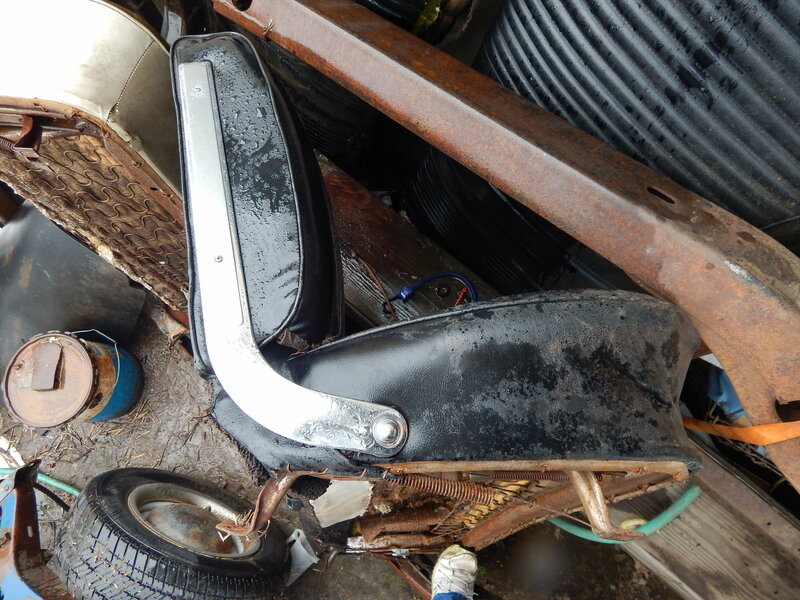 Then I picked up a ratty 1970 Supreme seat like the gold colored one shown in this thread. The arm rest face is cloth with vinyl on the back, but it doesn't have the pattern the seat does. The color is (was) the same, but no pattern. This seat is thrashed but the bones are good so I saved it as a possible core to rebuild. OK, I just went out to take pictures and found the arm rest does have the cloth with the pattern on it underneath the vinyl that folds when it is raised or lowered. Well, then I stand corrected. The yellow car above looked to be vinyl and patterned cloth, not patterned cloth and other cloth. 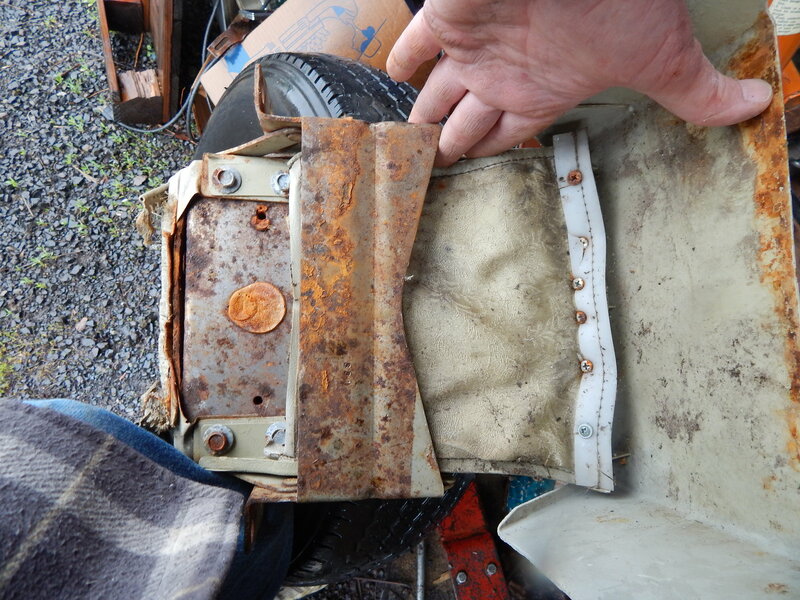 It does seem odd that all the cloth wouldn't have been patterned, and this may have been recovered over the years. But if recovered they did a good job as the seams and welting (?) all look good. Last edited by tcolt; Today at 02:04 PM. Excellent pictures John. I'm not sure I can see what the controversy is about. Does this am rest not use vinyl at all? Is the patterned fabric visible from the outside much or just "hidden" filler pieces? Is the first picture of the top of the arm rest vinyl or where do we see vinyl? I guess, I could see some years special designs with vinyl together with the patterned fabric... What does the picture of the black seat show us? Quick Reply: Tricky question: Does front bench center arm rest have vinyl or fabric as pictured?